I received the Canon PowerShot SX20IS 12.1MP Digital Camera a few days ago. I wanted a good quality camera for all-around, basic shooting. The main features that attracted me were the wide angle/zoom lens and the video option. I am not an expert, or even an experienced amateur. 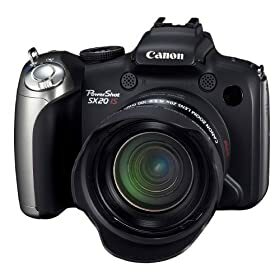 I just want to be able to point, shoot, and take decent pics and some occasional video, so I was thrilled when Canon PowerShot SX20IS 12.1MP Digital Camera arrived this week. In my opinion, the best eye-pleasing pictures are those that show the vibrant colors and color variations - all other things being equal. I've experimented with various settings and taken the same shots with those various settings, and compared shots taken with Auto, Landscape, Portrait, etc. against the Foilage setting [SCN/Foilage], and the Foilage setting is by far the best for bringing out the colors (which it is meant to do anyway). Compared to those pics taken using the Foilage setting, the ones taken in the other settings are dull - not that they aren't decent pictures in the other settings, just compared to the Foilage pictures they are dull(er). So for basic shots, I will probably use the Foilage setting most of the time for all-around shooting - the pictures are beautiful. One other thing that hasn't worked for me is connecting it to HDMI on my TV. I'm going to take it to Best Buy and try it there. If it still isn't working, I hate to send it back because it is a good camera , but I would like the HDMI feature to work to see my videos in true HD. In summary, the wide-to-zoom feature is great, takes very good pictures (especially in Foilage), takes excellent video. The video option is excellent - you can take pics while filming, and you can simply press the video button in the back to start taking video even if you're in a picture-taking setting - very nice feature. See here for a sample of pictures taken with Canon PowerShot SX20IS 12.1MP Digital Camera.